In 1954, Fangio had started his season in a Maserati, winning two of the initial three GP’s. Indianapolis counted as a race for F1 but was never contested by the European powerhouses. 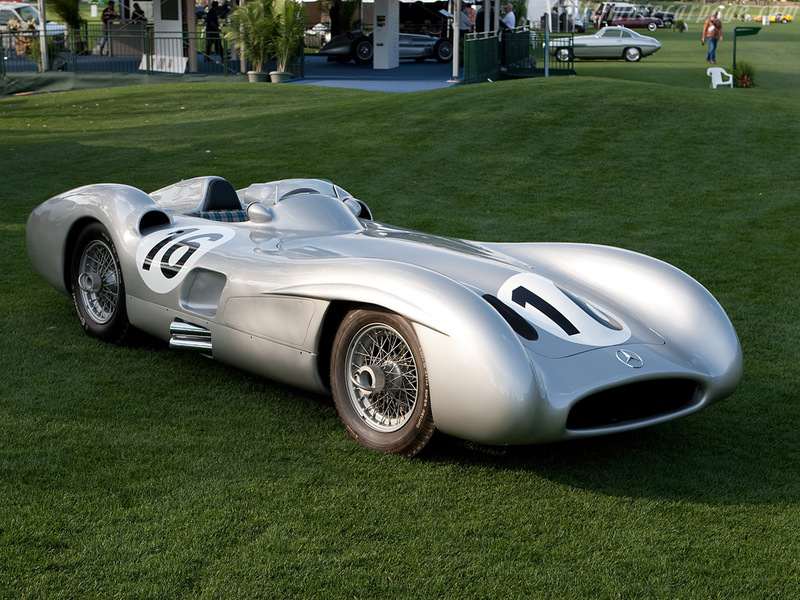 Mercedes entered the “Monza” streamlined car for the French GP, with which Fangio took his third victory of the season. 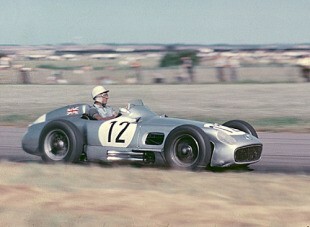 In Britain, despite setting the first 100mph lap of Silverstone, Fangio experienced problems throughout the race, hitting several oil drums in an ill handling car. He finished fourth behind the Ferraris of Gonzalez and Hawthorn and the Maserati of Marimon. For the German GP on the 1st August, Mercedes had brought the new open wheeled W196, with which Fangio dominated the remainder of the season, winning In Germany, Switzerland and Italy and ultimately his second World Championship. Attractive as the original car was, it’s dynamics did not lend themselves to twistier tracks and Fangio requested a car without covered wheels, as he felt he could position the car more accurately on the circuit. This chassis 06/54 was one of two produced in this configuration. Stirling Moss had caught the eye of Mercedes team manager Alfred Neubauer in 1953, who advised his manager that he wanted to see how he would perform in a better car. Moss bought a Maserati for the 1954 season and despite unreliability issues, performed well enough to be signed by the German team for 1955. Mercedes dominated F1 in 1955, the only blot on an otherwise perfect season was Monaco. Fangio retired with transmission troubles, and Moss led until Lap 80 when his engine blew, thus handing the victory to Trintignant’s Ferrari. This was also the race that Ascari lost control of his Lancia and crashed into the harbour. Fangio won in Argentina, Belgium, Holland and Italy and finished the season as World Champion for the 3rd time. Following the tragedy of the Le Mans disaster, France cancelled it’s Grand Prix scheduled for the 3rd July, Germany, Switzerland and Spain also cancelled their respective races. The British GP was held at Aintree for the first time on 16th July 1955 and Moss would win his first ever Grand Prix. Mercedes entered four cars for Fangio, Moss, Kling and Taruffi and were favourite for success, despite Maserati being competitive, Ferrari were struggling and there was entries from Vanwall and Cooper with which Jack Brabham made his F1 debut. Moss qualified fastest from Fangio, and immediately took the lead at the start. Fangio passed Moss but was overtaken once more by Moss on lap 3. Throughout the 90 lap race, Fangio would lead for a few laps, before Moss passed once more, they continued nose to tail for the remainder of the race, but at the flag it was Moss, to the huge crowds delight, that took the flag. To this day, Moss still isn’t convinced that he beat the Maestro, and Fangio, the gentleman always denied it. The Guardian reported Moss “waved Fangio through … Fangio drew alongside him as they approached the chequered flag and then, it seemed, hung back to let Moss cross the line first … it was a sporting gesture and fair“. Absolutely superb piece. Thank you so much. The On This Day contributors to TJ13 are doing a brilliant job of weaving stories together. Well done! Man, i love those old racing stories, Grazie mille Carlo! Our sport is a tapestry rich in colour, noise and life. Even when tragedy strikes, we should be celebrating a life lived rather than an existence endured. I still remember Ayrton Senna’s words in a Russell Bulgin interview published in January 1994. Truth, Justice…..and the American way? Surely not Judge! My grammar was most particular – I would not use the conjunction ‘and’ adjacent to the same noun more than once in a sentence. I have just read your article, and a wonderful piece of writing it is. I hope you don’t feel I have plagiarised your work. I would imagine a lot of the sources available are similar for everyone. I do take inspiration from different writers and am developing a style now which I’m more comfortable with. Tomorrows will provide a different perspective.